I’m not a huge fan of this overly-commercialized holiday, but I am a big fan of chocolate (the darker, the better). So, any excuse to indulge in chocolate deserves at least a little bit of attention here on the blog. 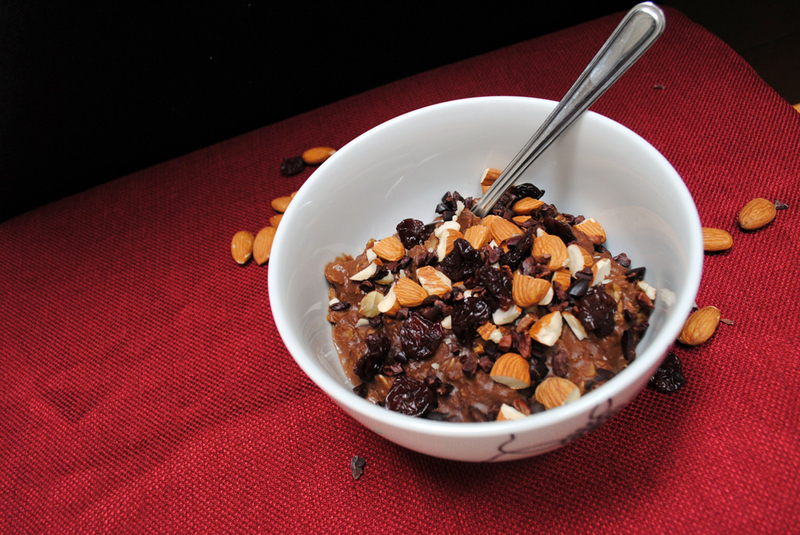 But, this oatmeal will not disappoint, and (bonus!) 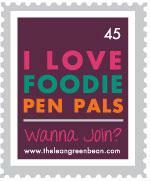 it’s healthy enough to be enjoyed any time! 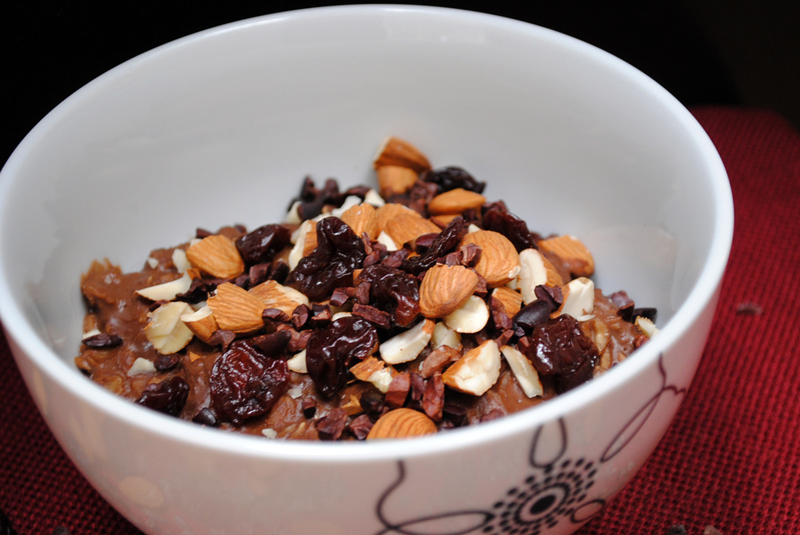 Featuring raw cacao powder, dried cherries, and almonds, this oatmeal is my next “fruit, nut, superfood” oatmeal combo. It was quite the treat to start my day! Raw cacao is considered a superfood because of its high levels of minerals and antioxidants. It is one of the best sources of magnesium found in nature, in addition to containing high amounts calcium, zinc, iron, copper, sulfur, and potassium. It is different than cocoa powder, which has been heated and therefore has lost the majority of its nutrients. 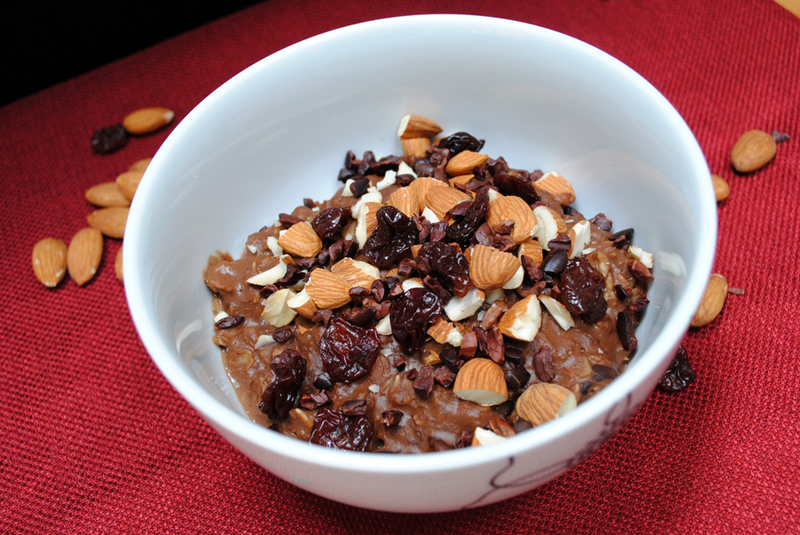 Head on over to Sarah B’s blog for more information on raw cacao and some tasty recipes. Combine oats and almond milk in a saucepan over medium heat. Add cacao powder and whisk to combine. Thinly slice banana into the mixture and stir well. Cook over medium heat for about 5 minutes, stirring occasionally While the oatmeal is cooking, add most of the cherries, reserving some for garnish. 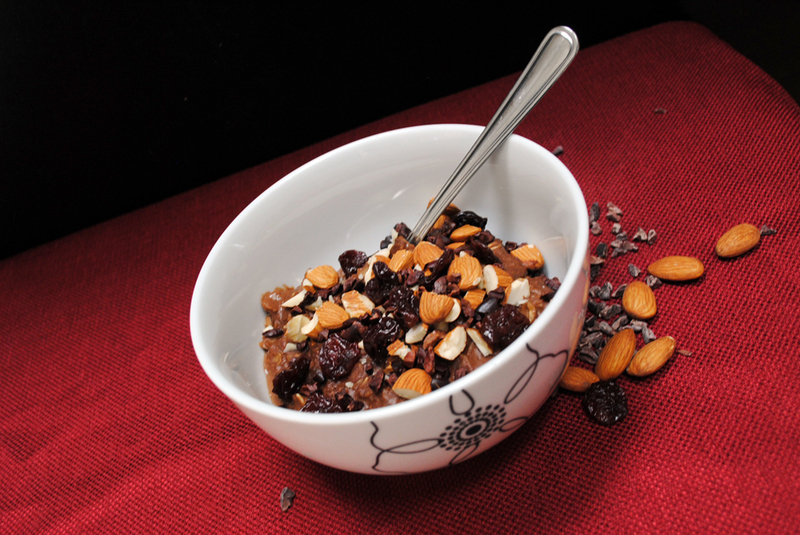 Transfer cooked oatmeal to bowl, and top with remaining cherries, chopped almonds, and cacao nibs. My favorite part of this oatmeal was probably the way the cherries added during cooking plumped up and became soft and juicy. 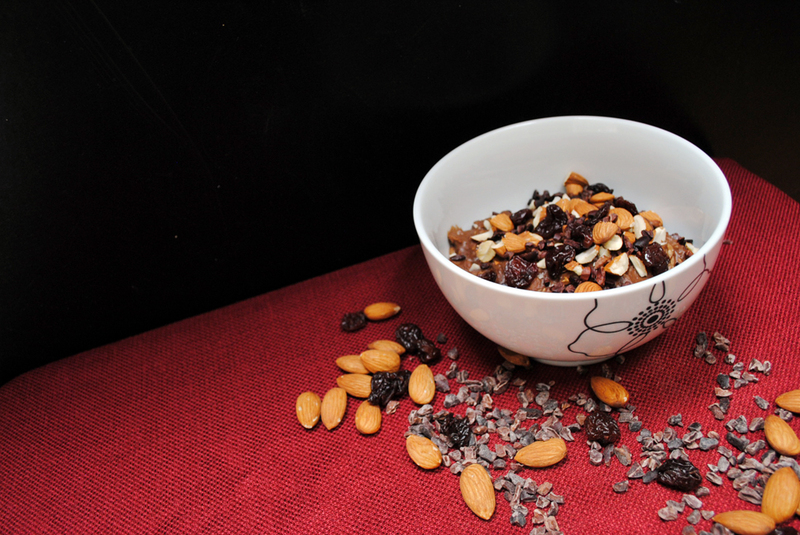 The almonds and cacao nibs add great texture. The only sweetener is the emulsified banana, so feel free to add maple syrup, honey, or another sweetener of your choice if you prefer your oats on the sweeter side. For Valentine’s Day, I made a special tea blend for my husband with Adagio Teas. On our honeymoon, we stopped in a great little coffee shop in Santa Barbara and order a pot of tea. Upon tasting it, we both declared it the most delicious tea we had ever tasted, and promptly returned to the cash register to purchase a 1 pound bag to take home with us. We aren’t exactly sure what was in the mix, but we know there was black tea, little pieces of chocolate and little chunks of dried apple. We savored our tea for almost a year, and almost cried when we drank the last cup. I was pretty excited when I realized I could attempt to recreate our tea with Adagio. So excited, in fact, I couldn’t wait until Valentine’s Day to give my husband his gift. We enjoyed our first mugs of our new tea last night, and while it may not be the “real thing,” it is pretty darn close! Adagio makes all custom blends available to others, so if you would like to try our tea for yourself, you can! If you do order our “Buccaneer” Tea for yourself, please let me know what you think. Hope you have a wonderful, chocolate-filled Valentine’s Day. Come over for a cup of tea and an amaranth popping lesson!